USA’s Maia Shibutani and Alex Shibutani perform their free dance at 2016 Cup of China. 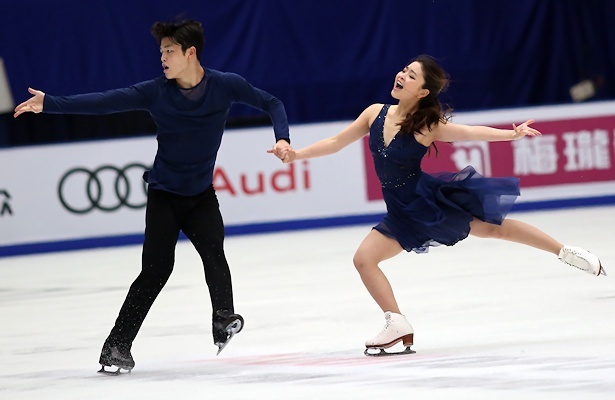 USA’s Maia Shibutani and Alex Shibutani came out strong in the free dance to claim their second Grand Prix gold medal this season at 2016 Cup of China. Overnight leaders Kaitlyn Weaver and Andrew Poje of Canada had to settle for the silver medal, while Russia’s Alexandra Stepanova and Ivan Bukin secured the bronze. The Shibutanis looked smooth and confident in their dance which is set to Arvo Pärt’s “Mirror in Mirror” performed by Anne Akiko Meyers and Akira Eguchi. The World silver medalists did not leave any points on the table, earning a level four for the lifts, twizzles and combination spin, while the footwork was graded a level three. The brother-and-sister team scored 111.90 points, not much below their season’s best, and with 185.13 points overall, they overtook Weaver and Poje. Weaver and Poje put in a strong performance to “Concierto de Aranjuez,” however, a level two in their diagonal footwork proved costly. The Canadians were ranked second in the free dance and slipped to second at 181.54 points overall. Stepanova and Bukin performed a characteristic Argentine Tango and had the same levels as the winners. The reward was a new personal best score of 105.32 points in the free dance and a total of 177.41 points. The tango seems to be a popular theme this year. Victoria Sinitsina and Nikita Katsalapov of Russia produced an excellent performance to “Tango Ballet” with top levels. Nevertheless, they remained in fourth place at 171.54 points. The crowd also enjoyed Poland’s Natalia Kaliszek and Maksim Spodyrev’s “Dirty Dancing” program in which they earned 150.78 points for sixth place. In the short dance, Weaver and Poje surprisingly edged out Shibutani and Shibutani for the lead. The Canadians improved their levels compared to Rostelecom Cup. The twizzles were a level three, although Poje had a wobble. The Shibutanis, on the other hand, only had a level two for the partial step sequence, which is part of the Blues pattern dance. Stepanova and Bukin looked improved over Skate Canada where a few low levels had held them down. The young Russians received over 70 points for the first time.